Tyler Denton signs for Posh. New Peterborough United signing Tyler Denton is a defender who loves to attack. The 22 year-old left-back has joined Posh on a season-long loan from Leeds United. His immediate aim is to pip another summer signing Colin Daniel to a first-team place at the ABAX Stadium. Tyler Denton (left) after scoring for Leeds against Luton. Denton, who spent part of last season on loa at League Two strugglers Port Vale, was signing number 11 for new manager Steve Evans since the end of last season. Evans used to manage Leeds and promoted the Elland Road Academy graduate into his first-team squad. “I’ve had a good football education at Leeds,” Denton said. “But I spoke with them in the summer and we agreed it would be best for me to go on loan again. My chances had become more limited with the arrival of a new manager. “I’ve definitely come here to play first-team matches so I will work hard and see where I end up. “I am a full-back who loves to attack. I love to get the ball into the penalty area, but every manager tells me it’s important to defend first. “I was young when Steve Evans was at Leeds, but I’m happy to be playing for him as he’s had success wherever he’s been. 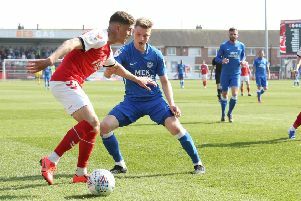 Denton is expected to make his Posh debut in today’s (July 6) friendly at Bedford. Evans believes he has signed another gem. He said: “I know Tyler very well from being in and around the first team squad at Leeds United. I elevated him into the first team group and he did exceptionally well. It is fair to say that he has developed further with a few games in the first team at Leeds. I watched one of those games where he scored the winning goal against Luton Town and he was very impressive. “He had an excellent spell on loan at Port Vale last season and we are absolutely delighted to bring him into our squad. He will compete anywhere on that left hand side for a place in our starting XI. It is massively important that we bring good footballers in and Tyler Denton is a good footballer. He works really hard and for one so young, he has an excellent pedigree. Denton has made just three cup appearances for Leeds.